It may not be time to turn out your calves just yet however it is something to start thinking about. This time of the year can be a very busy stressful time of year so here at O’ Donovan Engineering we aim to reduce your labour on the farm. One of the latest products to be added to our extensive product range is the ‘Feed 4’ Mobile Feed Trough. This trough can be easily moved around the farm by a quad or jeep, making it easier to feed calves when turned out to ensure they continue to thrive and also to move livestock from field to field. This trough is 16ft long with a unique feature of folding into an 8ft trough for ease of transportation. This feature makes it much easier to move the trough around the farm from field to field. When the trough is folded in for the transport position it is 5.5ft wide. 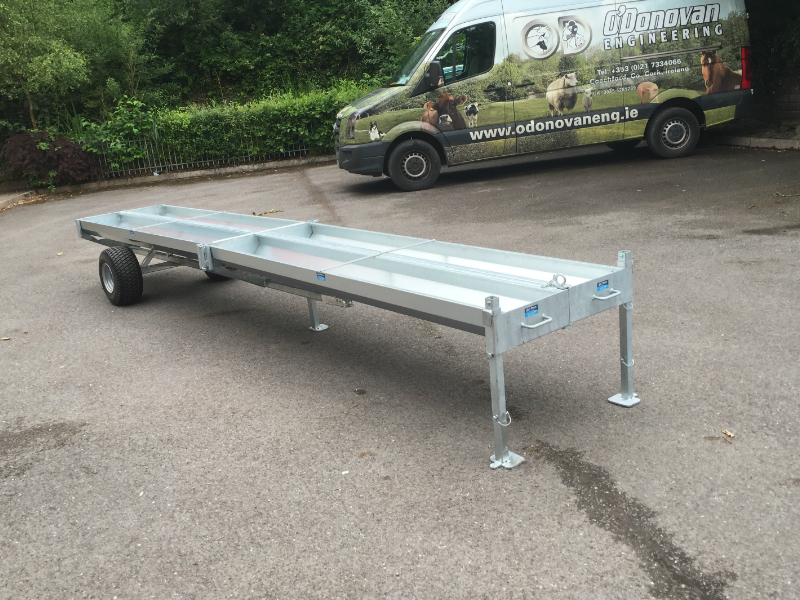 There is an easy hinge system to fold out the trough which folds over the hitch for animal safety and to ensure the trough cannot be transported in field mode. There is 32ft linear feed space with this trough and it is 625mm off the ground to suit young and old stock. 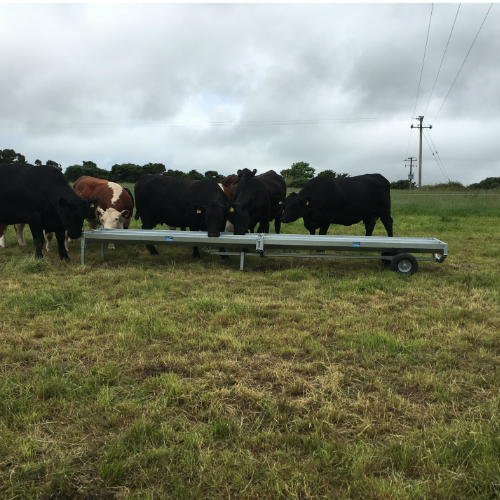 The mobile feed trough can save you time by eliminating the need of moving free standing troughs individually to each paddock with the use of a tractor. It is also a safer way of moving troughs around the farm and removes the chance of damage to a trough during lifting and transporting. The ‘Feed 4’ mobile trough can also aid the moving of young livestock from field to field as they will follow the trough without any safety worries. However this trough is not road legal, it is intended to be used solely around the farm.